Paphiopedilums and cypripediums, commonly referred to as Slipper Orchids or Lady Slipper Orchids, are arguably the most spectacular of China’s native orchids. But there are numerous other attractive species, both epiphytic and terrestrial, which will also be mentioned briefly in this article. 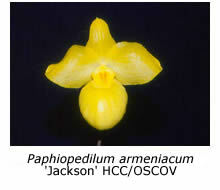 In nature paphiopedilums are found only in Asia but cypripediums are more widespread, being found throughout the northern hemisphere, although almost always at altitudes or latitudes where the summers are cool and the winters freezing. 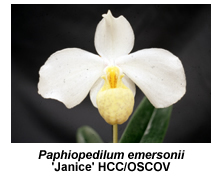 In China paphiopedilums are generally found in southern (warmer) habitats and cypripediums in the mountains, some at altitudes as high as 4000 m.
At least sixteen paphiopedilum species are found in China, many of them also occurring in the neighbouring countries of Vietnam, Laos or Burma ( Myanmar). 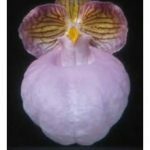 Paphiopedilum barbigerum, P. dianthum and P. emersonii are the only species claimed to be endemic to China by Chen, Tsi and Luo in their recent book Native Orchids of China in Colour. All except one of the sixteen species grow either as terrestrials or lithophytes, only P. dianthum being found growing on trees (occasionally on rocks) in open forest. Arguably, P. micranthum is the most spectacular of the Chinese paphiopedilums, with its large, near-spherical pale pink (sometimes white) pouch. I still remember when I first saw this species at an orchid show in Adelaide in the early 1980s, where it won Grand Champion orchid for Syd Monkhouse, at that time proprietor of Adelaide Orchids. 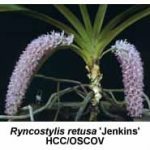 Syd had purchased several un-flowered plants of this newly discovered species at a street market in Hong Kong for $5 each the previous year and imported them to Australia through quarantine. I could also have purchased plants of P. micranthum at a street market in Kunming in 2002 at the absurd price of a dollar per plant! However, both their export from China and their import into Australia is now forbidden by CITES regulations. If the authorities continue to allow such unrestricted collection of this and other Chinese paphiopedilums from the wild, they will eventually become extinct in China. Today, there is no need to grow plants collected from the wild. Nursery-raised seedlings, bred from selected cultivars already introduced into Australia, will produce far superior blooms to most of those to be found in nature. Another striking Chinese paphiopedilum is P. armeniacum. Its flowers are a little smaller than those of the above species but the pouch, sepals and petals are a striking, glossy yellow colour. This species is found on rocks or well-drained slopes in limestone areas at altitudes between 1400 and 2100 m. Both it and P. micranthum will therefore tolerate quite cool conditions and some growers in Melbourne have had considerable success growing them without heat. 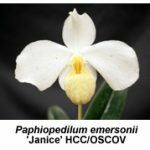 Other paphiopedilums found in China include P. appletonianum, P. barbigerum, P. bellatulum, P. concolor, P. dianthum, P. emersonii, P. henryanum, P. hirsutissimum, P. insigne, P. malipoense, P. purpuratum, P. tigrinum, P. villosum and P. wardii. 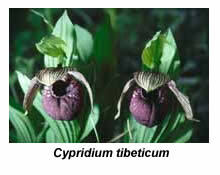 There are over twenty Chinese cypripediums distributed throughout the mountains of China, most being found at altitudes between 2000 and 4000 m. As far as I am aware, none are available in Australia and, if they were, few would survive for long in our climate unless they were provided with a special glasshouse maintained within the temperature range of 0-20°C. 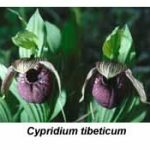 I was fortunate to see and photograph five different cypripedium species growing in the wild near Zhongdian in northern Yunnan Province. Cypripedium flavum was one of the most spectacular, producing its yellow flower, sometimes spotted red, on a leafy stem about 300 mm tall. It, and all other species we found, grew among shrubs or beneath trees on grassy slopes at altitudes above 3000 m. C. guttatum had much smaller plants and flowers but occurred in larger colonies, so that its red-spotted flowers easily caught the eye. C. tibeticum had plants intermediate in size but its dark, purplish red flowers were just as large as those of C. flavum. It was the first cypripedium that I found in the wild and the memory of that moment will always remain with me. The dissimilar C. lichianense grew beneath conifers on a slope so steep that one needed to wedge oneself securely using rocks or trees as footholds before attempting photography. It differs from the above species by having two large, almost spherical green leaves, heavily spotted with red or brown blotches, and lying almost flat on the ground. The lip is yellow, heavily covered with small red spots, while the dorsal sepal is almost completely red. 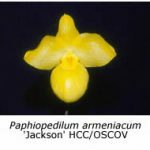 Unfortunately, the above cypripediums are not available in this country, while many of the paphiopedilum species, although now available here, cannot be successfully cultivated by all. 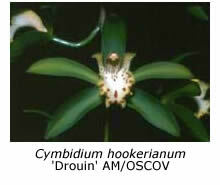 Fortunately there are many other Chinese orchid species that are both readily available and easy to grow. Some of those described in Native Orchids of China in Colour by Chen, Tsi and Luo, are listed below in alphabetical order. 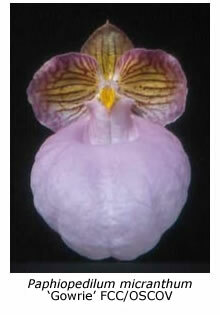 This book describes 403 different orchid species, about a third of those currently known to grow in the wild in China. Bletilla striata is well known in cultivation in Victoria, where many gardeners grow it under the common name, the Chinese Ground Orchid. Its plants die down during autumn and then resume growth in late winter or early spring. Their purple flowers open sequentially in late spring. It prefers a terrestrial mix and a sunny location. Twenty-six bulbophyllums are listed in the above book. Most of them require shady, humid and warm conditions. The most well known are Bulbophyllum odoratissimum, B. umbellatum, B. retusiusculum and B. ambrosia. Their flowers, like those of many other bulbophyllums, last in good condition for only a week or two. Eighteen calanthes are listed, including Calanthe triplicata, also a native of northern NSW and Queensland. Although this species can be grown in a ‘cosy’ shade house in Melbourne, it does much better with winter warmth. Ten Chinese coelogynes are described in the above book. 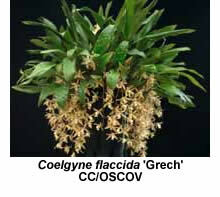 Those grown in Melbourne include Coelogyne fimbriata, C. flaccida, C. viscosa and C. corymbosa. The last is a real gem, producing glistening white flowers with brilliant orange lip markings. It’s found at high altitudes and dislikes the heat of summer. All four are suitable for shade-house culture. 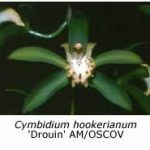 China is a major habitat for cymbidiums, no fewer than 24 species being listed; all can be grown in a shade-house, although some may grow better with winter warmth. Species seen growing here include Cymbidiumdayanum, C. eburneum, C. elegans, C. ensifolium, C. erythraeum, C. hookerianum, C. insigne, C. iridioides, C. lowianum, C. mastersii, C. tigrinum and C. tracyanum. 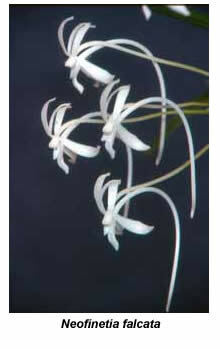 China is also home to large numbers of dendrobium species, 45 being described in the above book. 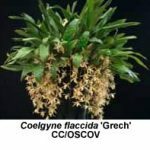 A few of these, including Dendrobium nobile, D. moniliforme, D. fimbriatum and D. loddigesii, are suitable for cultivation in an unheated glasshouse or ‘cosy’ shade-house in Melbourne. In nature these grow under warmer conditions than we usually experience during winter, but they can survive the cold if kept dry because they enter dormancy at that time. Other species that are best grown in a heated glasshouse include D. aphyllum (syn. D. pierardii ), D. crysanthum, D. falconeri, D. heterocarpum, D. infundibulum, D. miyakei (syn. D. goldschmidtianum ) and D. wardianum. There are at least 19 Chinese erias, including Eria javanica and E. coronaria, occasionally seen on our show benches. The terrestrial genera Habenaria, Herminium and Hemipilia are also native to China but are seldom or never seen here. Many of the species in these genera grow at altitudes over 3000 m.
Most growers think that the genus Liparis is not worth cultivating because of the repulsive odour of the flowers of Australia’s best-known representative, Liparis reflexa. But there are many other species in the genus, most of them with tolerable, if not pleasant, perfumes. China has at least eight species, including L. viridiflora, which in my heated glasshouse reliably produces its tiny green flowers every autumn. 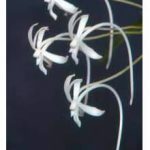 Japan and Korea are usually cited as the home of that delightful miniature cool-growing species Neofinetia falcata, but it’s also found in many Chinese provinces, including northwest Yunnan, which is at least 1000 Km from Japan. I had thought that Neofinetia was a monotypic genus but Native Orchids of China describes a second species, N. richardsiana, as a native of Sichuan province. There are six Chinese pholidotas, all preferring intermediate cultural conditions. I grow Pholidota chinensis and P. articulata. There are also six pleiones native to China (the book includes Taiwan among China’s territories!). Pleione formosana is a common sight at our spring shows while P. bulbocodoides is seen occasionally (the two may be synonymous). 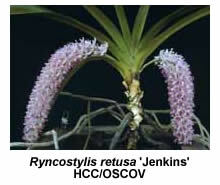 The intermediate or warm-growing species Rhyncostylis gigantea and R. retusa are also native to China (and to many other Asian countries). Their colourful ‘foxtail’ flowers make them highly desirable orchids if you can provide them with sufficient heat, humidity and light. Then there is Thunia alba, which may or may not be synonymous with Thunia marshalliana. It enters dormancy during the winter months and may therefore be grown without heat in Melbourne. The tall bamboo-like canes produce a succession of attractive white flowers early in the New Year if the plant is provided with ample water, sunlight and fertiliser from early October. Finally we have the genus Vanda, which comprises seven Chinese species if we ignore the recent re-assignment of several of them to other genera. Best known is Vanda coerulea, which contrasts with most other vanda species in being amenable to cultivation in a well-lit, cosy shade house in Melbourne. It has now been line-bred through many generations to produce brilliant blue flowers as shapely as those of any hybrid.